I have to admit, I was pretty excited to receive this album to review. I have an older 7" by the band that I really like, so it was nice to finally be able to check out the band's debut full length. Shallow Cuts is one of those bands that's not quite a band all the time. The members live in different parts of the country and only get together a few times a year to work on music. It kind of sounds like the same situation as the drummer I play with. Except he lives in the same area as the rest of us but still only bothers to show up a couple of times a year. Anyway, back to the matter at hand. 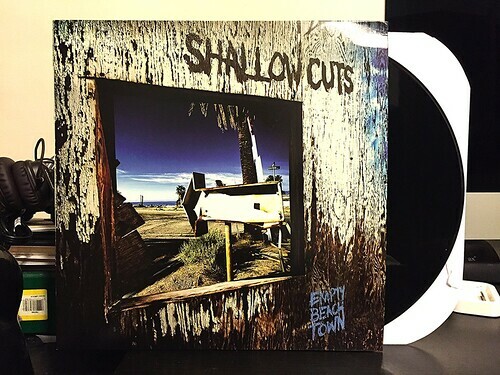 Empty Beach Town is a really strong release from Shallow Cuts. The album has that feel of older punk rockers that are starting to slow things down a little bit. They're taking a bit more time constructing their songs and building their hooks. They're starting to let some rootsy Tom Petty and Springsteen influences subtly creep into their songs. In many ways I feel like this a record aimed square at my demographic; someone in their late thirties or early forties with a lot of Leatherface records in their collection. Let's be honest, that is my demographic to a T. And while I certainly wouldn't mind if Shallow Cuts had a little more of a bite to some of their songs, this is still a pretty great record and a really great listen when you're crashed out on the couch on a Sunday afternoon drinking a root beer.